Crystal Lumière™ LLC was formed in 2010 by artist and Crystal Illumination Art™ creator Gail R. Mitchell to "bring the transformative quality of illumination, light and color to the human experience and celebrate its ability to inspire, heal and nourish our physical, mental, emotional and spiritual well-being." Ms. Mitchell is an artist, entertainer, entrepreneur and visionary. Born and raised in New York City, she has had a life-long interest in the arts. Gail has developed and honed her innovative patent-pending Crystal Lumière™ prismatic art for more than five years. She created her unique art form without formal training, stumbling upon the process when she was working on a theatrical lighting project. She immediately began experimenting, suspending crystals from various heights and angles and directing different types of light through them. Having studied and worked with energy and alternative healing, she was aware of the effects of color and light in psychosomatic and neurophysiological medicine and initially used her light paintings for healing. The response to her first installation was so overwhelming, she realized this was a new art form. Her work is about interactively engaging the viewers' senses, allowing a transcendental experience to take place, leaving behind a visual mystery. Gail is the creator of Empowering Caregivers (www.care-givers.com) and was the founder of the National Organization For Empowering Caregivers to provide resources and referrals along with educational, emotional and spiritual support to family members and professionals who care for the chronically or terminally ill, disabled or elderly. She was keynote speaker at many conferences, conducted ongoing workshops on care giving and published over 200 articles and journal exercises. She also founded Sedona Source, a destination management company, where she worked with seminar leaders and corporations to create programs that took place outdoors, using nature to help participants experience mindfulness in their lives. She created custom art tours that brought perspective clients into various artists’ studios and homes. Previously, her company JM Productions produced special events, fundraisers, commercials, industrial and trade shows. 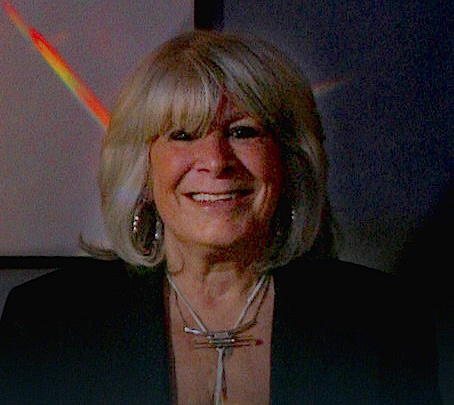 Gail designed sets, props, magic illusions and costumes and created décor for special events. Now, she has channeled her past experience into Crystal Lumière™ LLC and introduced the unique Crystal Lumière™ Prismatic Art Installation Kits. Gail is lighting the way for people who want to experience this transformative art form and sensory experience in their own homes, retail businesses, healing places and public spaces. "Art is a universal language. It is my aspiration to continue lighting the way for people to experience this transformative sensory art experience.